Ever think there are eyes watching you? Ever wonder if the trees could talk, what would they say? This chainsaw carved sculpture represents the eyes and ears of the woods. I wonder what this old man would say if we had ears to listen? The sculpture stands about five feet tall. 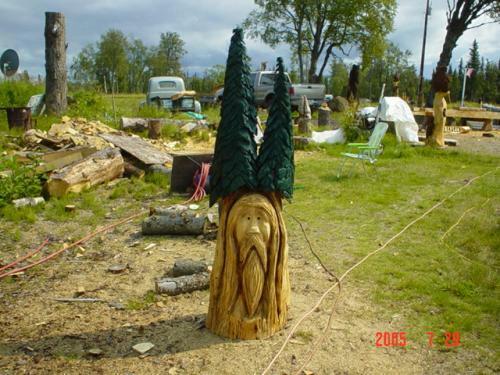 We produce hand-crafted Western Red Cedar and Alaskan Spruce carvings from The Dreamers Woods, LLC, Port Angeles, WA. Keep in mind that all carvings are individually finished and therefore may vary slightly from the posted picture. Carvings are made from natural wood products and are stained with a natural oil-based deck stain. To freshen your artwork, simply apply a new coat of deck stain. Checks and cracks may occur and are a natural process of drying wood and should not be considered a flaw or defect of the carving, rather an enhancement to the character of the piece. Copyright © 2019, The Dreamer's Woods.